Stage 1 (gain approx 75hp/100tq) USD $1295. Stage 2 (gain approx 120hp/170tq) USD $1495. ECU software for the BMW X5M / X6M was enhanced by VF Hex Tuning engineers resulting in a substantial increase in throttle response and power. Various enhancements included comprehensive air charge enhancements for the turbos and Vanos re-calibration for aggressive intake and exhaust camshaft timing and effective relative cylinder filling. 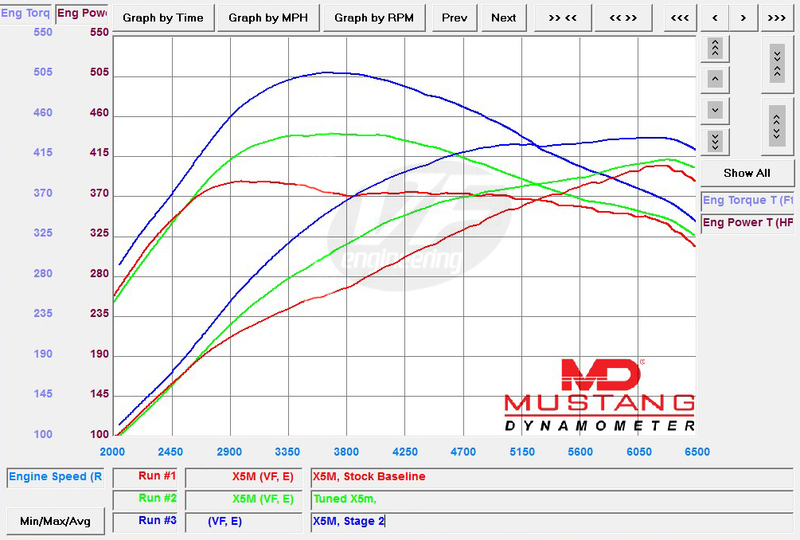 This calibration was scientifically developed/tested and measured on a Mustang MD500-AWD chassis dyno using 91 octane. The top speed limiter was removed and combined with refined ignition, fuel and camshaft calibration to create a massive gain in power. Factory torque management has increased in complexity compared to prior generations of BMW engine managemet. Hex Tuning engineers understanding of the true design parameters and function rules allow them to fine tune and enhance the smoothness and transitioning of power (drivers torque request). Many features are included with this software upgrade which give the user great features to enjoy. Optional off road software is available for a sport exhaust system which results in gains of 120hp/170tq. Contact us for information on this option. Worldwide models of the X5M/X6M are applicable and the software is user programmable with the use of the Hex Flash programming cable included. The Hex Flash cable works in conjunction with a laptop and is used to read and write software from/to the vehicles computer (ECU). This allows the user to revert to original programming anytime they wish.